Introducing Real Fruit on the Bottom. It's everything you love about Voskos® with real chunks of fruit in a bigger 6oz size that’s both healthy and delicious. With real sweet peaches, velvety Greek yogurt and no artificial sweeteners or colors, the taste is purely delicious. Full of succulent strawberries fresh from the fields, this delightful flavor serves up happiness in every cup. A Greek classic, experience flavor bliss with this forbidden fruit mixed with our rich and creamy signature Greek yogurt. You’ll go wild after the first spoonful of this blast of blueberries in our signature Greek yogurt—a truly great flavor experience. Our rich and creamy Greek yogurt is even better when paired with slightly tart yet delightfully sweet raspberries. 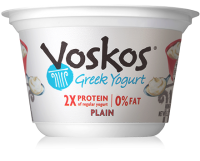 Savor our latest Greek yogurt flavor. 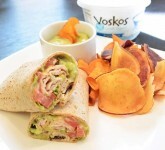 Our delicious turkey roll-ups make the perfect summer lunch! 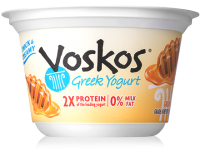 Get the latest news from VOSKOS® on Facebook, find recipe inspiration on Instagram or follow us on Twitter. One taste is all it takes to fall in love with authentic VOSKOS® Greek Yogurt. 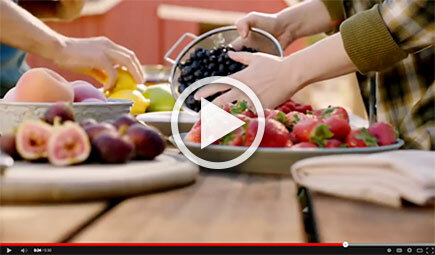 Crafted from farm fresh milk and real, freshly picked fruit, each healthy bite is sure to put a smile on your face.